Holiday Matsuri is a Christmas cosplay convention that is known around the world as one of the most unique and vivacious conventions. Holiday Matsuri 2018 was no exception to this notion. 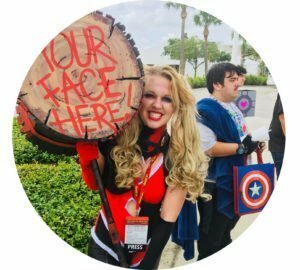 Held at the World Center Marriot in Orlando, Florida, Holiday Matsuri (aka Holmat) continues its tradition of encouraging festive-themed cosplays for its annual spirited event. I had the pleasure of attending as Press this year so that I can give you the full breakdown of this highly-discussed con, complete with a list of pros and cons. Despite its general cheery disposition, this convention is not without its flaws. The overall aesthetic that this convention exudes is nothing short of magical. The hotel is decorated with conventional Christmas tress and lights as far as the eye can see. One of the main attractions (and photographer hot spots) is the massive Christmas tree in front of the Starbucks (where you will find me 99% of the time). I think it can be said that Matsuri’s reputation is built upon by the ardor that cosplayers bring with them to this convention. It can be felt throughout the weekend, and no amount of qualms or lack of coffee seems to get in the way of their festive and communal spirit. In short, this is a convention for cosplayers. Matsuri has been held at the World Center Orlando Marriot for a number of years. It’s annual occurrence here only solidifies the fact that the space for this convention is prime. If you’ve spent to much money in the quaint Artist Alley sector, you can easily pry yourself away to take a stroll through the main arena. Here you can discreetly observe the creative characters that have been reconfigured to include reds, greens, and sleigh bells. This large area is a photographers paradise, with mini photo studios set up around every corner for the cosplayer’s convenience. All weekend, there were no shortages of optimal locations to take photos of your cosplay. And while every experience is different, generally the people at this convention are here in high spirits that play off of the true theme that started the cosplay community. I can say for myself that I felt welcomed and included. In my Jackie Frost genderbend cosplay, I was thrilled when fellow Jack Frost-ers would cheerily extend their own staff to bump mine as an unspoken greeting. Cosplayers come to this convention to have fun. It’s the one convention where people seem to forget about their Instagram following, scheduled photoshoots, the networking prospects—and just have fun. I believe that any comic-con’s first priority should be to ensure the safety of its convention guests. Especially in today’s world, the matter of security should never, ever be taken lightly. That being said, Matsuri security (alongside every single Florida convention I have attended) is disturbingly slack in this department. As Press, I rarely have my bag checked (huge oversight) and at this convention in particular, I wasn’t checked at all. The only measures the staff took was to wrap an orange tape around my Jack Frost prop (without inspecting) to mark it as “safe”. My fellow cosplayers also expressed the fact that security seemed lax at the convention this year. While strict security measures may make entering the con more time consuming, nothing should discourage the safety and security of the people in this building. I arrived at Holiday Matsuri 2018 around 2 p.m. on Friday afternoon. And while I didn’t expect a prime parking spot, I was not prepared to be redirected to a parking structure down the street. While these alternative parking lots weren’t too far away, I’m curious whether or not the parking fees at these other structures cost more than what I would have paid on property. If anyone knows, let me know in the comments! The shuttle buses were a necessary touch (our bus driver was actually incredible and high-spirited), but considering I arrived around the same time as last year, I wonder what caused the lack of parking space available at the actual hotel. Side note: Same person on my team was actually staying at the hotel and had to park off-site. What?? Because I was Press, I didn’t have to wait in the (literal) two-mile-long line to pick up my weekend badge. As I said, I arrived around 2 p.m. On my bus, there was a fellow cosplayer who happened to be a part of the same Instagram group chat I was in. We introduced ourselves and parted ways to get our separate badges. Without much hassle, I was able to get my passes and then made a couple of laps around the convention. In about two hours, I was able to window shop in Artist Alley (twice) , get a coffee, and cosplay-watch as I took a break. On my second break of the evening (my friend was wearing heels), I ran into this cosplayer again who said he had just gotten his pass. Other people told me it took as long as 4 hours to get their passes. I’m not sure what the hold up was this year in distributing badges, but the pickup process is definitely something that needs to be reevaluated before Holiday Matsuri 2019.